Merk Insights - Japan's kaput?! Japan’s economy is down but not yet out. The world’s third largest economy won’t go quietly. Both these statements are merely my opinion, but if you believe there’s a risk that I’m right, you may want to pay attention to what the implications may be. •	Can the government pay the interest on outstanding debt? •	Can the government roll over maturing debt? Let’s the take last item first: when you have lots of debt, do you want to beg for another loan or should you default? The reason Greece agreed to harsh terms imposed by the International Monetary Fund (IMF) was that they couldn’t self-fund themselves. The budget before servicing debt is referred to as the primary budget balance. A country considering a default needs to be aware that the day after they default it might be difficult to get a fresh loan at palatable terms. As such, a country with a primary budget deficit has an incentive to service its debt because it will need further loans. In contrast, a highly indebted country with a primary budget surplus has an incentive to default on its debt. In Greece’s case, they now have a primary surplus; Greece is in the driver’s seat when it comes to negotiating terms on its debt loans, as they could walk away. One caveat to this is that domestic banks might collapse if they hold lots of debt of their own government. Japan has a primary budget deficit, i.e. needs to pile on to its debt burden no matter what interest rates are. A goal set last year to eliminate the primary deficit by 2020 appears elusive now. To balance its budget before paying interest expense, Japan – quite simply – needs to either raise revenue or cut expenses. In April, Japan’s value added tax (VAT) rose from 5% to 8%; whether another rise to 10% scheduled for October 2015 will be implemented is an open question. As Europeans have learned, VAT is a powerful way to raise revenue. Except that the higher rates have also caused significant headwinds on consumption. As long as Japan has a primary deficit, it may be at the mercy of the markets. This ‘mercy’ can be expressed in the interest rate a government has to pay. Japan’s 10-year bonds (JGBs) currently yield 0.4% per annum. Differently said, the market does not appear to be concerned about Japan’s ability to meet its future obligations – at least not according to this measure. But even as we consider dire scenarios, the biggest threat Japan may be facing is that Prime Minister Abe’s policies actually work. That’s because should growth materialize, odds are that JGB’s would sell off, increasing the cost of borrowing. That’s not a problem immediately, as not all debt matures at once. However, should much of the debt burden have to be financed at a higher rate, it may make it all but impossible to finance the deficit. In practice, as the European debt crisis has shown, it’s not about the average cost of borrowing, but the rolling of debt. Spain, with an average maturity of about seven years for government debt, was considered very prudent in its debt management. However, during the peak of the Eurozone debt crisis, there were concerns that Spain might face trouble refinancing its debt. It didn’t matter that only a comparatively small portion of Spain’s debt needed to be refinanced. Governments – just like corporations or individuals – can face a cash squeeze. But fear not, because Japan has a few tricks up its sleeve. The best known one is the Bank of Japan (BoJ). While the BoJ denies it is financing government deficits, it’s gobbling up an enormous number of JGBs, thereby keeping yields low. It does have the side effect that this formerly highly liquid market is experiencing a drought. But why bother, what could possibly go wrong? In the aftermath of the announcement, the yen fell sharply, while both domestic and international equity markets jumped higher. Japan wants to boost the returns on its pension fund, but may achieve quite the opposite. In the short-term, yes, both domestic and international equity prices soared. But the new allocation has only been announced, not implemented. As such, the pension fund will buy assets at elevated prices. And because Japan’s population is ageing, odds are that they will be net sellers rather than buyers over time. During the roaring markets in the U.S. in the 1990s, prevailing cooler heads cautioned that the government investing in the stock market makes little sense, as while it may boost short-term returns, future returns would likely be lower. There is no free lunch. •	By buying foreign assets, Japan is ready to debase the value of the yen further, while trying to preserve the purchasing power of those assets. •	In the run-up to Zimbabwe’s default, the country’s stock market soared; simultaneously the value of the now defunct Zimbabwe dollar imploded. 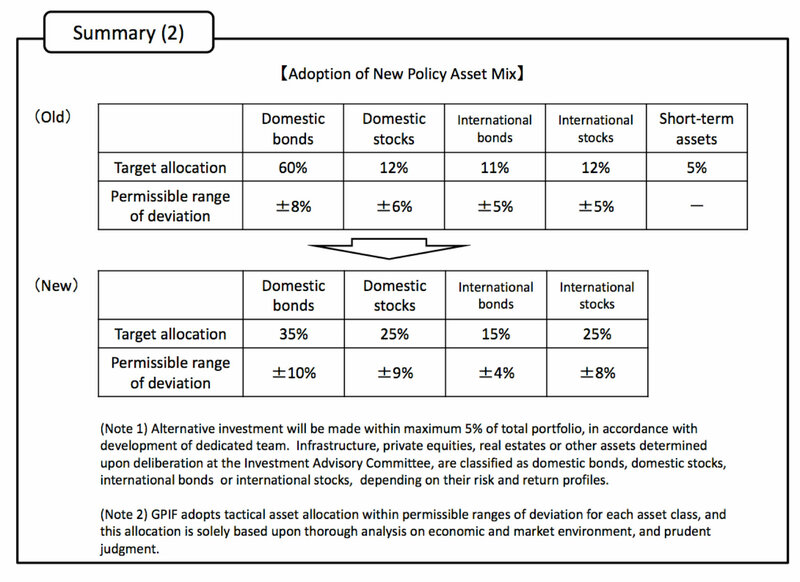 It appears only logical that Japan would invest its nest egg in stocks, with an emphasis on foreign stocks. 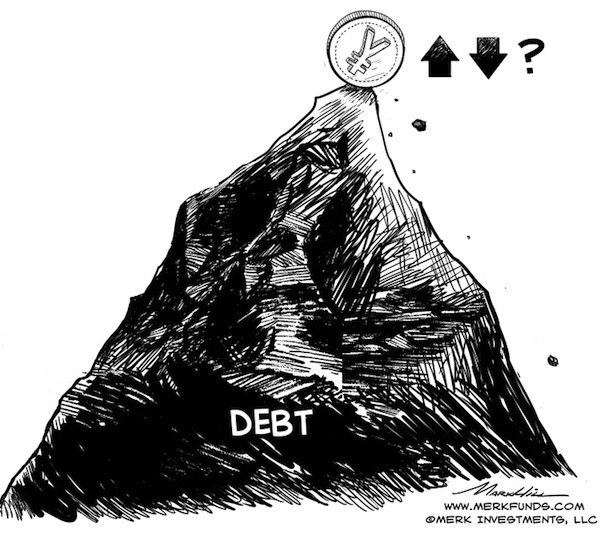 It’s logical if and only if Japan intends to debase the value of its debt. •	Some opt to short JGBs. Critics have labeled this the widow-maker trade, as JGB’s have held up; indeed, when shorting bonds, one has to constantly pay (rather than receive) interest. There are some that short bonds using options. When properly executed, that strategy may yield steady losses, then possibly a major gain at some point. We don’t pursue this strategy and caution anyone to be aware of numerous risks this strategy entails, ranging from the fact that one is fighting a central bank through the use of derivatives. •	Short the yen. As we have indicated in the past, we don’t see how the yen can survive this. But be aware that foreign exchange analysts are rather frustrated with our take on this. That’s because a price target of ‘infinity’ (an infinite number of yen per dollar) is difficult to fit into any model or short- to medium- term forecasts. And clearly, the yen’s demise is unlikely to happen in a straight line. In fact, whenever the yen rallies, I get lambasted by so-called experts that the yen is still a ‘safe haven’ currency. My take is that the yen’s ability to benefit from a “flight to safety” has been directly correlated to the market’s perception of how effective Abenomics is. As policy makers double down on Mr. Abe’s policies, the yen’s safe haven characteristics may well erode further. •	Buy Japanese stocks. Printing money to buy stocks has been a boon for the Japanese market. And as Zimbabwe’s experience has shown, stocks can perform well in this environment. But Zimbabwe’s experience didn’t end well. Neither do I believe will Japan’s. Given the much higher volatility of stocks versus the currency (assuming no leverage is employed), it’s a much higher risk way of protecting from government failure. Also keep in mind that should a default become reality, it may have profound implications for Japan’s banking system, as well as Japan’s economy as a whole. No country in history has managed to keep its citizens wealthy while defaulting on its debt. •	Gold. Ironically, in the hours after the announcement of the recent initiatives by the Bank of Japan to increase its quantitative easing, as well as the change in Japan’s pension fund strategy, gold fell – not just in U.S. dollars, but also when priced in yen. A little later, gold was priced higher in yen, but still down when priced in U.S. dollar. Gold has not fared very well of late, but it may serve as a good diversifier as Japan’s economic gamble plays out. As we have a dire view on Japan, we should add that we don’t think Japan’s problems are all that unique. There is too much debt in the U.S. and Europe. The one country where citizens are fed up with deploying central banks to cure all problems is Switzerland. We will have an in-depth discussion of Switzerland’s vote to force the Swiss National Bank to hold a minimum of 20% of its reserves in gold in an upcoming Merk Insight (to ensure you don’t miss it, sign-up to receive our free newsletters). On that note, please register for our upcoming Webinar on November 20, 2014, where we will discuss how investors can build their personal gold standard.